Because helping them learn the value of a job well done doesn't have to be all work and no play. 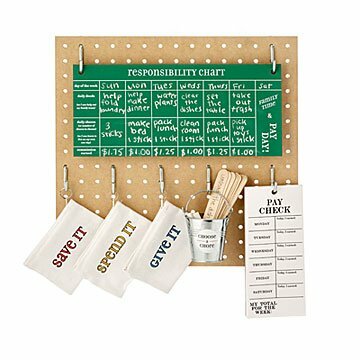 This inventive responsibility station provides a fun, interactive way to teach kids positive life habits— because helping them learn the value of a job well done doesn't have to be all work and no play. Set up a list of daily tasks on the chalkboard chart, and when they're completed, your child selects additional responsibilities from the "Choose a Chore" bucket (you choose the reward). At the end of every week, they'll turn in their weekly "commission" on the included pad to receive their reward. Where they put it—the "Save It," "Spend It," or "Give It" pouch—is up to them. Designed by Jennifer Fisher. Includes: pegboard, chalkboard chart, 7 hooks, bucket with adhesive label, 20 wooden chore sticks, notepad, and 3 canvas pouches. Assembled in Holtsville, New York from domestic and imported materials. This has changed our life! My daughter now cleans everyday and keeps track of her money. She is also saving money to give to an animal shelter. It teaches responsibility and compassion. We love this product!